Two Convenient Ways to get Tickets!!! Purchase tickets onsite at Fright Kingdom at our Ticket booth! Fright Kingdom is 100% INDOORS. We will be OPEN Sat: Oct 29th, Sun: Oct 30th, and Halloween Mon: Oct 31st regardless of the snow. Don’t be stuck indoors, come out and visit us for some warm and dry Halloween Fun! 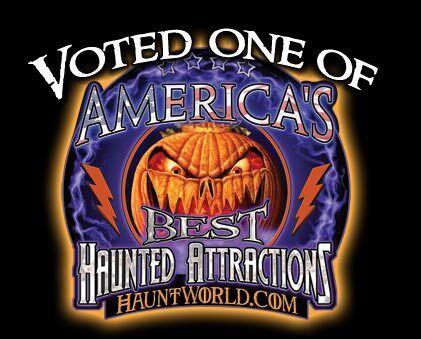 The Fright Kingdom haunted house is one of the most professional haunted houses in the entire New England area. If you enjoy movie quality detail guaranteed to please the eye coupled with a thrill of a fear factor, then Fright Kingdom's Haunted Houses are for you. The Fright Kingdom staff have a strong family background in construction, which translates into incredible scenic design and fantastic sets which transport you to another world. Located inside a huge warehouse year after year, non-stop building and design work yields an exciting walk through trip through their 'FrightKingdom'. The first walk through attraction, Bloodmare Manor is a Victorian era style house that had a few skeletons in their close that decided to come back to life! The entire set is staged to the early 1800's, Bloodmare Manor is home to the notorious and diabolical Broodmare's, a family stained with a dark and sordid history. They are the only known living residents, but you are about to find out that they are not alone. You are invited within these walls of this Victorian-themed manor of horror. You will encounter the dark and mysterious family, and see many of their evils along the way, will each twist and turn will bring you one step closer to your last? Send in the clowns! That will be the last thing you will want to hear at our Psycho Circus in 3-D. A descendent member of the Bloodmare family, Ezra, decided to have illusions of grandeur with this twisted event. He wanted to open up his own circus, so that Ezra could see his name in lights. The family name simply could not escape him, and between abuses, incidents, and mysterious events, Ezra's mind could no longer handle the stress. One night, after a particularly poor review coupled with horrible attendance numbers, Ezra snapped and murdered his entire fleet of circus workers. But, the show must go on... and it does with a horrified ghostly presence. Looking for something a little less scary? Try the Hardly Haunted Matinee which is geared towards Halloween family fun. Remove the chills and remove the scary thrills, but still see all the fun and beautiful scenic design. These performances, check dates for availability, give children (accompanied by their adult guardian) an opportunity to trick or treat through our two "lights on" haunted attractions... but don't worry, most of the monsters are sleeping. Candy and bags will be provided by Fright Kingdom at no extra charge so be sure your little one wears their costume.